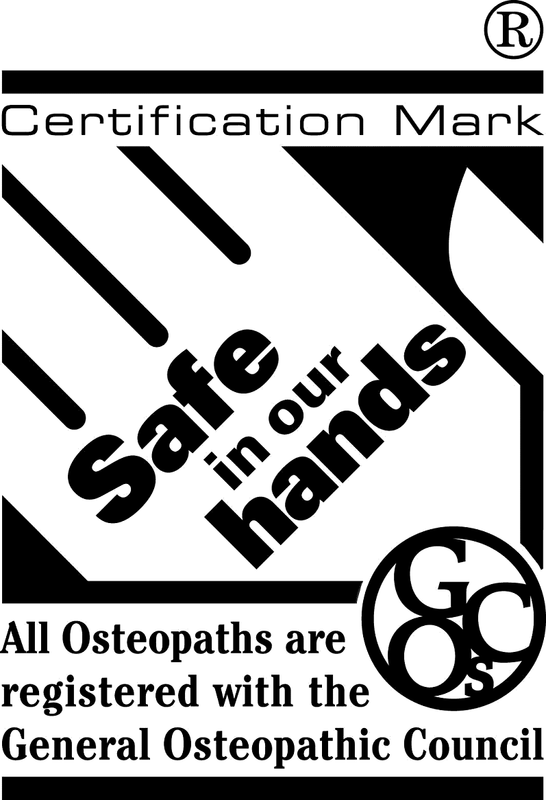 Why should we care that it is International Osteopathic Healthcare Week? At a time when the NHS in the UK is under severe and mounting pressure created by a perfect storm of staff recruitment difficulties, finite resources and increasing patient demand (by numbers and expectation), it is worth thinking laterally to find solutions. NHS innovators are doing this, and talking about patient-centred approaches, integrated medicine and simple, yet-effective, messages about healthy nutrition, exercise and lifestyle choices. These are exactly the founding principles of Osteopathy! We must remember that Osteopathy was founded as a system of medicine in the USA at a time when the ‘alternatives’ were very poor quality healthcare. In fact, during the influenza pandemic of 1918-1920, US osteopathic physicians obtained better results than their non-osteopathic medical colleagues (for a superb history of this, I’d urge you to read ‘The Great Influenza’ by John M. Barry). On the basis of this and other factors, Osteopathy grew in popularity and, in US hospitals and health centres today, DO’s work alongside MD’s performing surgery, prescribing medication as well as carrying out musculoskeletal treatments, and are fully integrated within the overall provision of community healthcare. In the UK we have a much older, more conservative medical profession more resistant to the acceptance of ‘new’ and ‘foreign’ models of healthcare. The path to Osteopathy’s migration from the US to the UK was far from smooth and, after the fiasco of the 1935 House of Lords select committee hearing which killed the attempt to pass an Osteopaths Bill, it was not until 1993 that the osteopathic profession achieved statutory recognition. During this process, and because of our strong emphasis on palpation, Osteopathy was somewhat pigeonholed into being perceived as merely a form of manual therapy rather than a system of medicine involving diagnostic skills. I am regularly told ‘I didn’t know that osteopaths did that’ and patients (of a certain generation) reminisce about the days when their GP knew them well, had time to spend with them and actually touched them! It is very timely to be reminded that osteopaths have many of the competencies which could help to ease the pressure on A&E and GP services. Recent developments, such as the acceptance of osteopaths in the NHS as ‘Allied Health Professionals’ and work to publicise and promote our role as the first point of contact for patients, should see the increasing use of osteopaths as a valuable human resource for community healthcare. Using public money for this will require an evidence-based approach. We always need more high-quality evidence to support the work that we do and, with a system that is patient-centred and not population-centred, there will be challenges to the type of metrics that are most suitable. Perhaps a move towards a more values-based approach will be the answer. Current public health issues including obesity, dementia, and antibiotic resistance alert us to the fact that care strategies must evolve to remain effective. Around 30,000 patients are treated by Osteopaths every day and this week reminds us that highly-skilled, intelligent, caring and professional Osteopaths are on stand-by to be included in the team effort to achieve good public health. 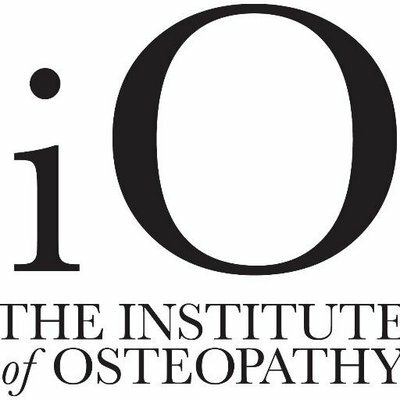 With the above in mind, we would like to join our colleagues from the Institute of Osteopathy and the International Osteopathic Alliance to express our support for this year’s Osteopathy Week – 15th April – 22nd April. On behalf of our chief Osteopath, David Propert, we will be sharing valuable articles and tips on our Facebook page here and spreading the word at Dolphin Square. Want to join us and learn more? Simply contact us here or speak to David here. In today’s blog post, we are sharing a client success story from Kate Osborne – our resident nutritional therapist. Kate uses a programme called ‘Metabolic Balance’ for healthy weight loss. This award-winning programme was developed in Germany by doctors and dieticians and is becoming increasingly popular in the UK. Kim lost 15.6 kg (2.5 stone) over a period of six months. Only 0.7kg of this loss was muscle mass. Water percentage increased from 44% to 52.7% over the duration of the programme and there was an improvement in body composition indicators. Kim discovered a new zest for life and was ‘astounded’ by the changes in her energy and focus. The IBS type issues that had affected her whole life had disappeared by week 2 and her skin looked radiant. 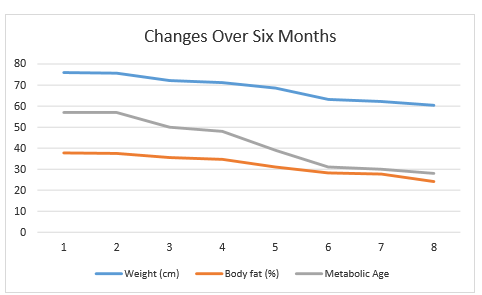 Kim’s ‘metabolic age’ which is calculated using the basal metabolic rate and the muscle to fat ratio dropped from 57 on her first visit to 28 on her final visit. Amazing results and we would like to congratulate both Kate and Kim for the great work. If you or anyone you know struggles with weight loss and would like to finally use a system that works and delivers lasting results, check Kate’s profile here. Osteoporosis is a condition that makes bones more brittle and prone to fracture. Although osteoporosis can affect men and younger people, post-menopausal women are most at risk. One of the best ways to help maintain healthy bones is to exercise regularly – which encourages the bones to absorb calcium and other mineral salts that keep bones strong. Weight-bearing exercises and weight resisted exercises are best for strengthening bones and muscles and as well as helping to keep bones in good health may also reduce the likelihood of falls as you age. Weight-bearing exercises are those where your body is supporting its own weight, such as walking or housework or carrying groceries. Weight resisted exercise involves pushing or pulling against an additional weight, like a dumbbell or barbell or resistance equipment in a gym. Anyone can benefit from weight training but it has been demonstrated that younger women who trained using weights have stronger bones later in life, this essentially means that you can bank bone when you’re younger to help prevent fractures later in life – a kind of insurance scheme for your body. A lifetime of active living not only protects your bones but also keeps your heart healthy and may protect you from other diseases such as cancer and type two diabetes. We, at Calmer Clinics, have a great team of osteopaths who would love to help you on your exercise and bone health journey. For more details, check the profiles of David and Alexia. We all tend to over indulge a little at Christmas and doing a little more exercise is a common New Year’s resolution. But how do you get the most out of your gym routine and how much exercise should you do to stay healthy? There is no denying that exercise is good for you. We know that those who perform a moderate amount of exercise on a regular basis are considerably less likely to suffer from diseases such as diabetes, stroke and heart attack or experience insomnia. Exercise helps older people maintain their independence and is one of the most effective methods of weight management, a growing problem in western societies. It is also very important for our psychological health, as it stimulates the release of endorphins, natural pain-killing chemicals that can also improve our mood. However, some people become a little disenchanted when the exercise they do doesn’t have the desired effect. “As a general rule”, she continues “if you are trying to build larger muscles, the most effective method is to use a weight which you can manage to lift 8-10 times before the muscles fatigue, in order to get the desired effect. If you are looking for stronger, leaner muscles, a weight programme based upon 20 repetitions would be more appropriate. But how much exercise do you need to do to be healthy? If you are aged between 19 and 64, research suggests that you perform at least 150 minutes of moderate-intensity, or 75 minutes of vigorous-intensity cardiovascular exercise each week plus muscle strengthening exercises on at least two separate days of that week. The good news is that these exercises do not need to be all in one go, and activities such as walking briskly to work (if your journey is more than 10 minutes) count as part of the total. If you are looking for a place with a wide variety of exercise choices, then check the gymnasium at our premises – Dolphin Square Fitness which offers personal training programmes, various classes and swimming.